Do you have a baby or toddler with asthma who gets some type of breathing treatment? Are you as constantly depressed as I was prior to discovering how to make these as painless and short as possible? When we first discovered N possibly had asthma and would have to have breathing treatments, it was a comedy of errors. He would scream miserably or flail about turning his head away from the little mask, or we'd simply use the setting where air would shoot into his face while he ignored us. When our next doctor saw us do this in the hospital, we received a lecture to strictly use the mask because it was more effective and it could make all the difference in the world to N's breathing. Suitably admonished, and now knowing that we'd have to be doing a lot of these treatments, we started to develop some habits. First, we got a bag and put together a nebulizing station. 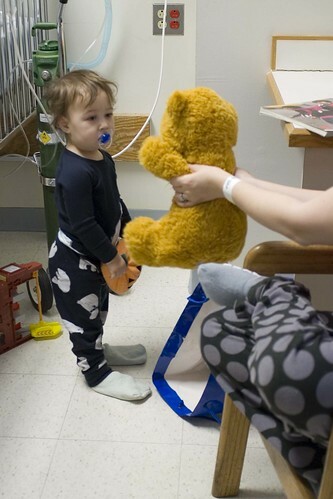 It included various nebulizer medicines, his nebulizer, a pacifier or five, and a small stuffed pumpkin. Second, if you have a hatred of television or movies for young children, get over it. An episode of the Backyardigans or Caillou makes the medicine go down, as it were. We often seat N on one of our laps, before a television and make sure he's nice and comfy with his 'paccy'. Before this, we also make sure that the medicine is ready to go so that the second he gets in our lap, everything starts. Third, we queue up the show, raise the volume, and nebulize. The first few times, you might get an angry baby. We've found that using the strap for the mask increases that chance by ninety percent, so we just hold his mask to his face and pray for the best. The good part is that if you do it on a daily basis for a while, and you always offer television during the treatment (and you are normally a 'no television for you' type of parent), you'll get a baby who is anxious to receive treatment. N now holds his own mask to his face and willingly turns on the machine. After everything is done, we offer him a sippy cup full of his favorite drink and let him guzzle it down. These various tips should lead you to a baby who is a little less anxious to shove that mask back into your own face, but no guarantees! Very good way to create this one. i am very very impressed to see this. i will try to make this product.